Barack Obama will be taking his oath in front of the Congressional building and become the newest US President. The Congressional building and the White House are in the news all over the world. These buildings are in the tradition of Western Greco-Roman architectural style, and give dignity to official buildings. But the sight of the Congressional building is also popping up in some unexpected places in China. 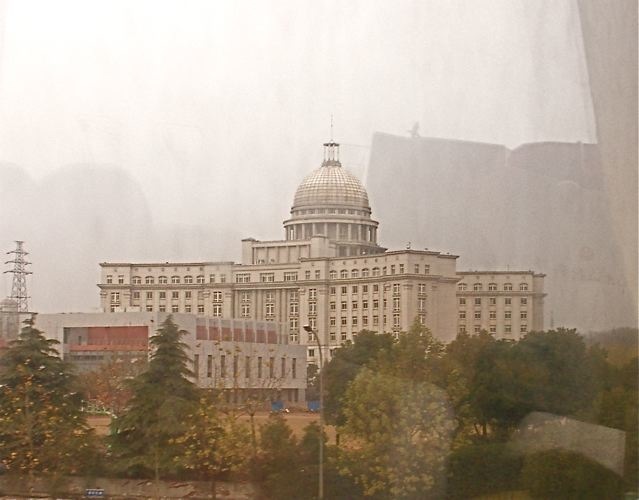 I was traveling in a bus through Nanjing 南京 when I noticed a familiar sight. The dome and the general look and feel of the building reminded me of the US Congressional building in Washington DC. My quick reaction caught this photo of a Congress look alike. 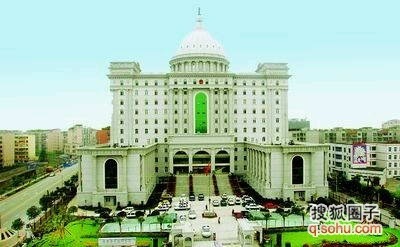 I searched the web and found this grand building referred to as the “office building of a certain village government”. I think that’s not correct. The surrounding is a large city and not a village. 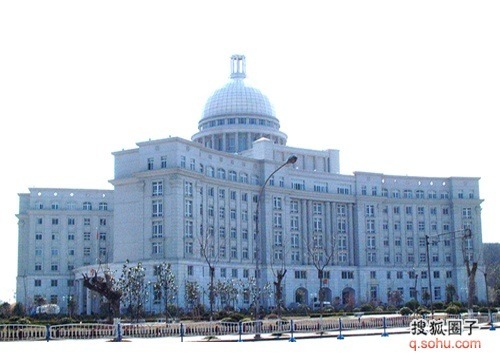 I began to see more buildings in Chinese web sites that look like the Congress building. They are photographed by Chinese netizens and posted on the web. These Chinese buildings are public buildings of governments at various levels. 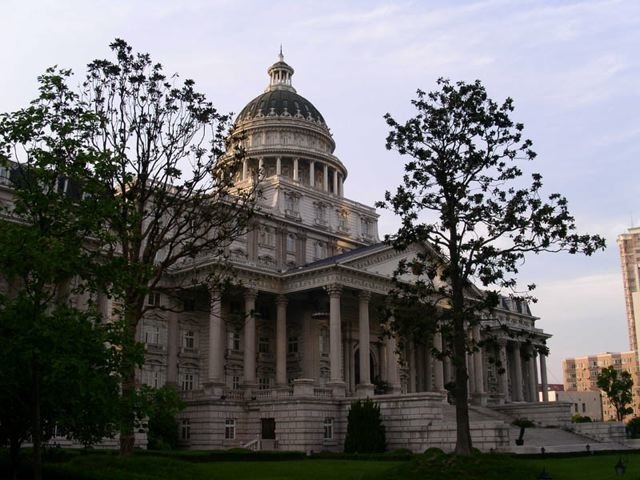 Big metropolitan cities like Shanghai may have a rationale and the budget to build grand court houses. But in many localities where the residents are living in poverty, where school buildings are old and falling apart, building official buildings in such extravagant style are inexcusable. As some examples below will show, some officials really have their priorities turned upside down. 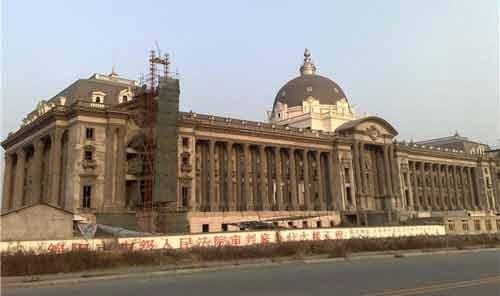 Chinese netizens have begun to lambast the extravagant government buildings. 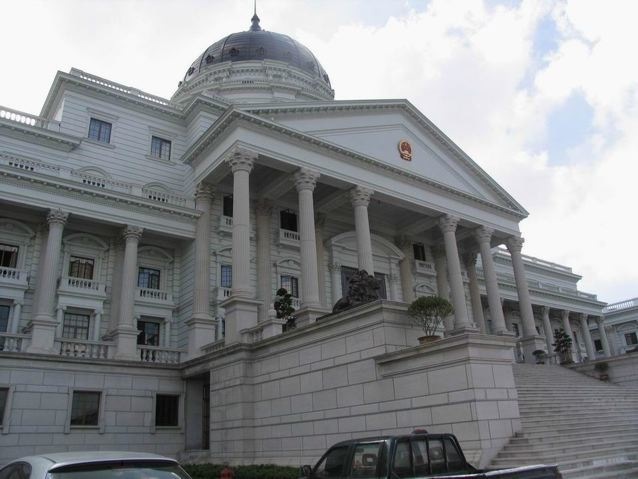 In particular, they ridicule some Chinese government buildings that try to look like the US Congress building, but they erroneously called them “White Houses”. They decry the self-aggrandizing public officials copying the US “White House” while ignoring the pressing needs of the ordinary people. 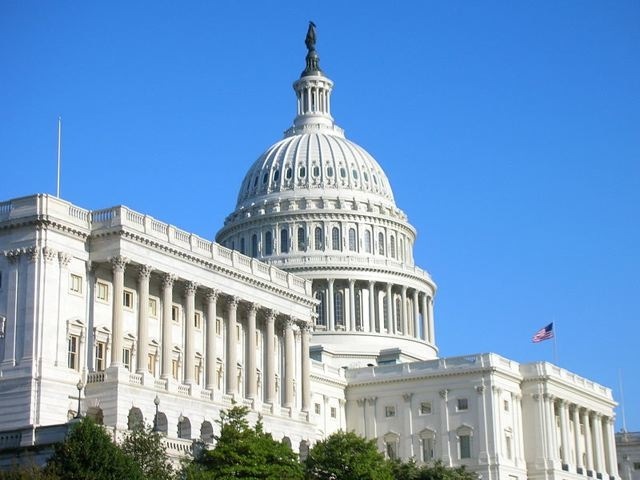 The photo below is that of the US Congress building. It is big and has a dome. 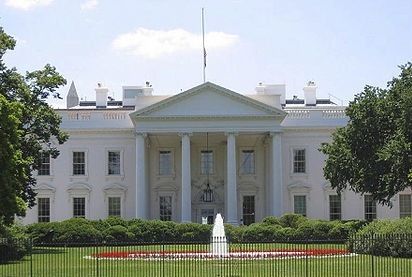 The photo below is that of the White House. It does not have a dome. 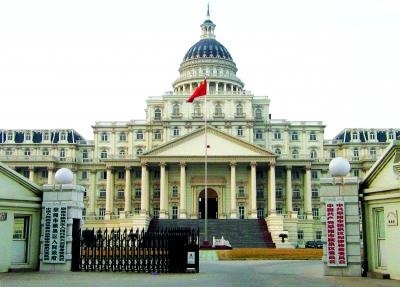 The Shanghai MinHang District 闵行区 courthouse is built to look like an European building. It sports a mansard roof under the dome. It may be ornate, but it fits comfortably into the cosmopolitan surroundings of Shanghai. 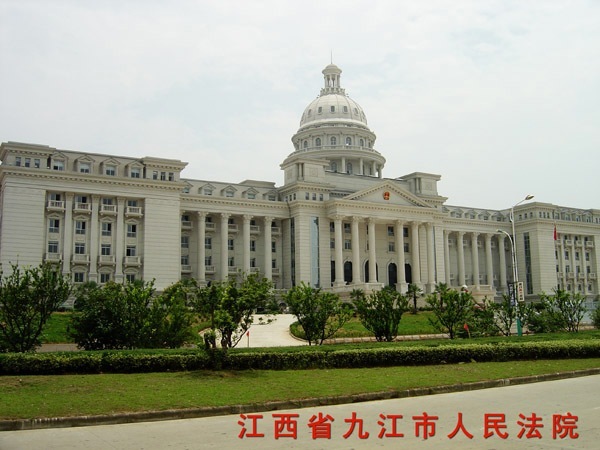 The JiuJiang city 九江市 courthouse in JiangXi 江西 province looks classical and dignified. It may be misplaced in a small city, but at least it looks good. 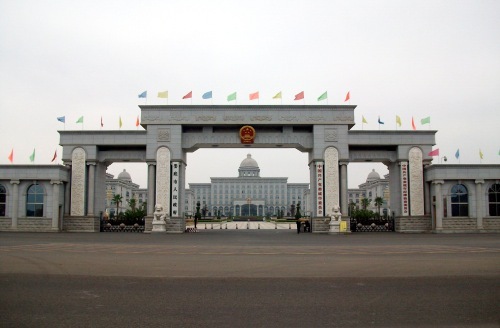 This so called White House is the government building of YuHuan county 玉环县 in ZheJiang 浙江 province. But for the red emblem, it looks fit for somewhere in Europe. 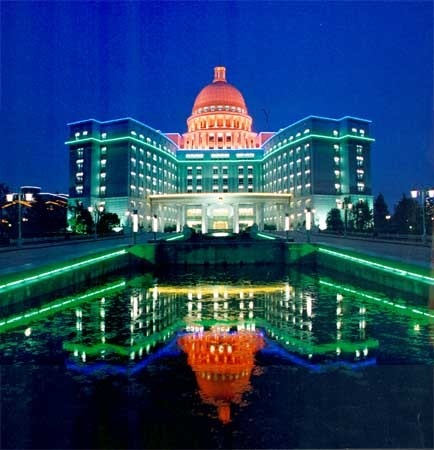 This is the district government building of YuHuaTai district 雨花台區 of NanJing 南京. The officials are so proud of their handiwork they light it up like garish Christmas decorations. The district prosecutor’s building of the WuHou district 武侯區 in ChengDu city 成都市 of SiChuan 四川 province. It is ostentatious with the big dome on top. I wonder if it makes the prosecutors more effective in rooting out corruption. 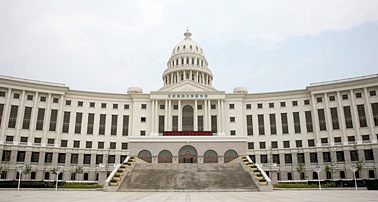 The government building of the ShunDe district 顺德 in GuangDong 廣東 province has the look of the Congress, but is built taller to accommodate more offices. It could not resist the dome to give it prestige. At night, it is lit up like a theme park to impress and wastes barrels of oil. 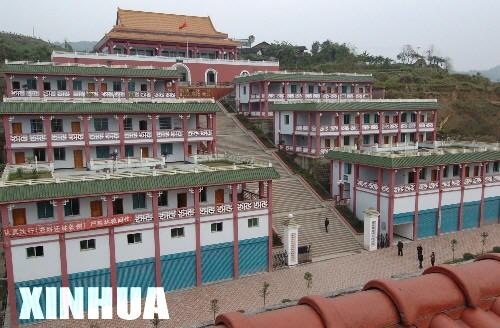 The government building complex of LiuDi city 婁底市 in HuNan 湖南 province is a large complex with several grand buildings, occupying 40 acres and costing US$60 million. This city is in a declared poverty stricken area. Twenty-six persons involved with the building of this complex have been charged with corruption by the central government. 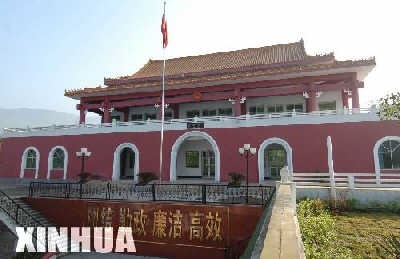 The government office of the WinChuan district 颖泉区 in AnHui 安徽 province is definitely too grand for a small, declared poverty district. 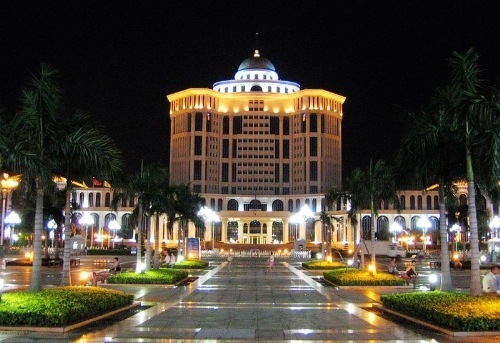 An official who blew the whistle on this extravagant building was arrested and was found dead in custody. The district’s top official has recently been arrested and charged with crimes including corruption. 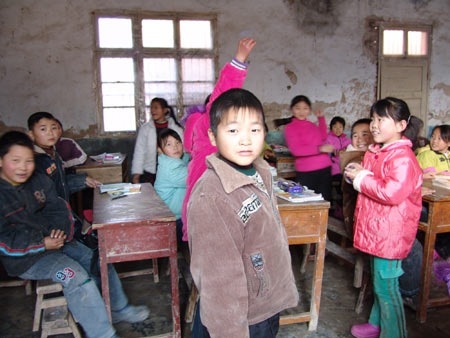 While the government of WinChuan had money to burn and built their big “White House” building, they had no money to rebuild schools for their children. The per capita income of the farmers in this district is only US$200 per year, this building costed US$4 million, 1/3 the district annual revenue. The government shamelessly applied for aid from the Japanese to rebuild their dilapidated schools for children. The Japanese donors were flabbergasted by this irony, but they nevertheless donated US$80,000 to build the school houses. Chinese netizens feel, rightly so, that WinChuan government opened China to international ridicule. The courthouse building under construction in MianYang city 绵陽市 in SiChuan 四川 province has the Chinese netizens howling. This city is in the earthquake zone that killed hundreds of thousands of people last year, and is receiving aid from various donors. The netizens feel the city government is misusing the aid funds to build such a grand building. In its own defense, the government claims the building was planned and budgeted years ago and only recently resumed building after delays. Universities got caught in the Congress look alike rage. The private Geely University 吉利大学, affiliated with the Geely Auto Company, built an imposing library in Beijing modeled after the Congress building. Even when government officials do not try to duplicate the US Congress building, they have the tendency to overbuild their office buildings. This complex in HuangJin township 黄金镇 in ChongQing City 重庆市 is built like a palace with a TianAnMen 天安門 look alike structure at top. Such excesses have been brought to the attention of Beijing in 2007. Premiere Wen JiaBao 温家寶 decried this practice and urged a stop to such government extravagances. Recently, the central government decreed that county-level leading official should have an office less than 200 square feet area. Such specific requirement is an effort to curb megalomaniacs from building excessively grand government buildings. But If the past is any indication, local governments will find ways to circumvent this central government restriction and commit other excesses. 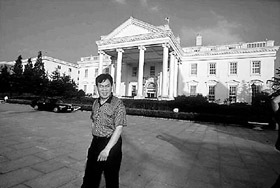 While the previous photos have been erroneously labeled “White Houses” by Chinese netizens, one Chinese land developer Huang ShaoLing 黄巧靈 knew the White House from the Congress building. 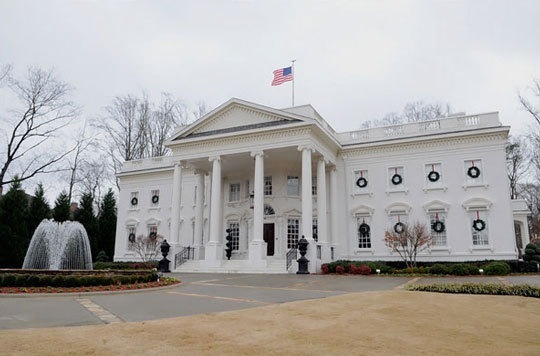 He built himself a White House replica as his residence in HangZhou City 杭州市. The Chinese are not the only ones fascinated with the White House. An Iranian American land developer (again?) built himself a replica of the White House in Atlanta with an oval office and the presidential seal. The only thing it did not duplicate were the surface-to-air missiles deployed on the roof of the real House. it is for sale at US$10 million, a steal for Chinese tycoons. Posted by Robert Wu on Monday, January 19, 2009, at 10:58 pm. Filed under Uncategorized. Follow any responses to this post with its comments RSS feed. You can post a comment or trackback from your blog. « SFM #37: Food. Durian, Friend or Foe?